Lakshmi’s name derives from the Sanskrit word laksha which means one hundred thousand. Laksmi’s name means aim or goal. Deeper understanding of her name is the final goal. The final aim is not to manifest heaven on Earth, the goal is to go back home to the source. She is commonly known as the energy of love, wealth, beauty, prosperity, fortune and abundance. This is a good starting point and has allowed the energy to remain over a vast period of time. In images of Lakshmi, you will see her wearing a pink or red sari, white or grey elephants, lotus petals and an owl. She will typically be in a body of water because it is said she was brought forth from the ocean and churned herself outward. Her relationship with Vishnu is very key. Vishnu has several avatars such as Krishna and Rama. Krishna who is sometimes depicted as a blue boy or teenager is a form of the Christ, a redeemer. Vishnu is often described as having a divine blue color, which is a representation of melanin dominate individuals. Lakshmi is the source of power for Vishnu. But she is also the source of strength for a lot of entities in the Hindi mythology. The image of the lotus is ubiquitous. You can find it in Ethopia as well as Kemet. Lakshmi is seen sitting or standing on the lotus. The lotus blooms and sprout on the surface of the water and have deep roots in the mud of the river. The lotus goes beyond the earth and water and goes into air. The lotus transcends the environment it was born out of. The lotus roots in the physical world but unfolds itself in the heavens. 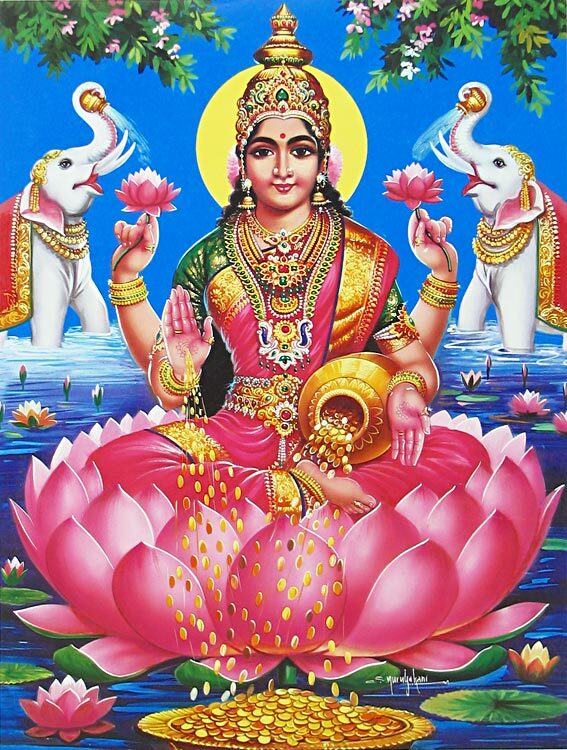 Because Lakshmi is on top the flower which represents her transcendental natures. She will have 4 arms- 2 pointing upwards and 2 pointing outward. Each hand has a different representation. On hand represents Dharma which correlates with your destiny- what you came to do on the Earth. The lotus flower represent the understanding and knowing of your purpose- the ori inponri. The lotus flower also represents the unfolding of your path and your destiny. The symbols depicted are formulas for her different aspects. 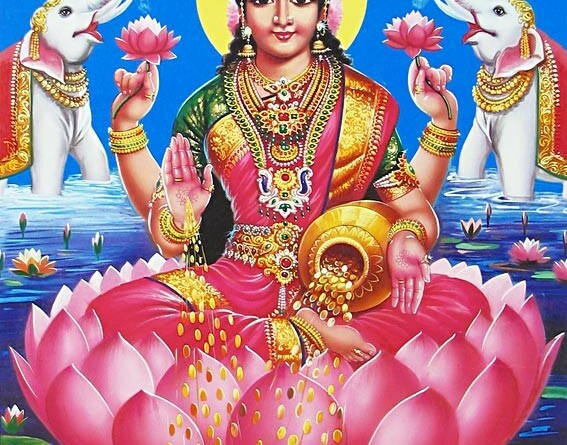 What formulas can you derive from the depiction of Lakshmi?